I just finished my first GORUCK Tough and wanted to share my packing list AAR (After-Action Review). Prior to my challenge I read as many posts (like this, this, and this) and watched as many YouTube videos as I could to know how to best pack. In adding my AAR to the interwebs, I hope to help others by sharing what worked for me. I used the GORUCK GR1 which, I admit, I got off ebay to save a few bucks. There were several other bags that I saw last night, and everyone’s seemed to hold up well enough (even the non-GORUCK packs). The GR1 was good for me and I was happy with the performance. On my pack I did NOT use a sternum strap or waist belt and it felt comfortable (relative term) throughout the night. My GR1 with American Flag Patch, Reflective Bands, and Carabiner. On the outside of my ruck I had the Reflective Reverse American Flag Patch and two reflective bands. I really liked these reflective bands as they were small, light, and stayed out of the way. There were several folks that had a reflective belt wrapped around their ruck. This just looked like it had the potential to get in the way whenever you needed to get in and out of the pack and I was glad I didn’t go that route. Along with that, I had weight-bearing carabiner (required by Cadre) and I also had a toy carabiner holding my Mechanics gloves. I quickly realized that having gloves hanging on the outside is a bad idea. I almost lost one within the first hour. I recommend that when you aren’t wearing your gloves that you store them in an easily accessible pocket (like the front one). In relation to the carabiner, I would recommend that you do not bring a locking biner unless the cadre asks you to. The particular use that we needed our carabiner for was unnecessarily difficult for those who had to deal with their locking mechanism. Bricks, Water, Nalgene, Otterbox, Riggers Belt. In my front pouch I kept my headlamp, two Kind bars, and some energy gels (I’ll talk about all those later). Also, after the first hour, I had my gloves in there. Inside the main compartment, I kept things super simple. I had my water source, bricks, yoga block, extra Nalgene, and my Otter box full of goodies. In addition to this, I kept my riggers belt (cadre required) in the top zip pocket for easy access. Just as a note, I was determined to not over pack. I simply accepted the risk that I may not have something I need. If that’s the case, my logic was that the consequences would only last for 12 hours. I made sure I had all the required items, a small select additional items, and resisted all desires to add anything else. Bricks – Securing is key! The bricks themselves were nothing fancy here. I just grabbed 6 bricks form lowes and wrapped them in duct tape. However, I benefited GREATLY from making them as snug, high, and secure as possible. To secure them I used the Cinch Strap & MOLLEE Adaptor kit from GORUCK. Worth every penny! The product page has a how-to video that shows how to set it up. I will say that once set, my bricks never moved. It was perfect. Of course, when you cinch them up high, there is a big empty space at the bottom of your pack. Just grab a yoga block and fill the space. They are perfect because they are light and don’t take on water. Water – 2 is 1, 1 is none. I already had a Geigerrig Hydration Engine and used that. I really like the Geigerrig concept and consider it a superior water pack solution in all areas… EXCEPT GORUCK. Within the first hour my pump fell off and I almost lost it. Luckily I was able to find it and toss it back in my bag. But, then I had to quickly resolve the dangling pump tube. It was a mild, but very annoying, issue to deal with. Thankfully, the Geigerrig still worked as a normal water pack without the pump. I’m not sure if I’d use the Geigerrig for my next event or if I’d just go ahead and get the Source Low Profile Bladder. Also, I as I mentioned earlier, use the ITW Web Dominator and have a spare as backup. In addition to my water bladder, I also had a standard Nalgene full of water. This is a MUST HAVE. The water bladder is great when you’re on the move, but it was a God-send when we stopped for a 5 min refuel to be able to open the Nalgene and chug half a liter of water without sucking it out of my water pack. Kind Bars not pictured… because I ate them all. As I mentioned in my packing philosophy, I wanted to pack light. For that reason, the only food I brought was 3 Kind bars and 4 energy GU. Along with that, I had a pack of Nuun electrolyte tablets. For my Kind bars, I chose Cranberry Almond because they taste good. I also liked that they were relatively small and flat. If I were to change anything, I’d probably up the quantity to 6. At each stop, I would have really liked to eat 2 of them, but I rationed to 1 per stop. I grabbed 4 Strawberry Kiwi GU. I didn’t plan to use them all but wanted to have 1 or 2 to share. I ended up consuming 2. The last one I had was around hour 9. I noticed an extreme boost of energy for my last hour. I’d use these again. Finally, I had some Nuun Electrolyte Tablets. I added them to my water sources prior to the start. I only refilled water once during the night and did not have time to add a tablet to the water. Overall, I assume they helped me stay better hydrated. I never cramped during the night, which I have been known to do on longer strenuous events. But, lack of cramps could be attributed to my serious pre-event hydration plan (aka, drink a ton of water starting the day before). Finally, I was super keen on the taste. Before any future events, I’d like to taste test some other options. I went ahead and got the Black Diamond Storm, mostly because of the multiple lighting options and that it is fully water-proof. I only really broke it out for the few hours we were on the very dark trails. Whenever we were on city streets, ambient light was always enough. The only note I have about the light itself is that, despite my practice beforehand, remembering how to switch between red/spot/and spread lighting was difficult. Be sure to take your time to assure yourself that you’ve mastered your headlamp functions before the event. As an added note, double check your batteries. I didn’t really think about it and just mechanically put 2 AA batteries in my pelican case as a backup. Yeah… my lamp takes 3 AAA. Thankfully, I didn’t need the spares. 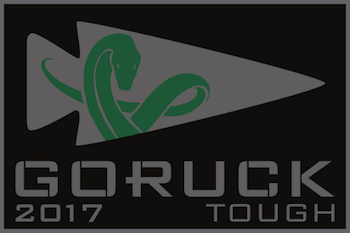 Click to find a GORUCK event near you! I already mentioned it, but I used Mechanics gloves. The are great, inexpensive, and get the job done. I wore them for the last 3-4 hours, as my hands were raw and cut. They made life better. I’d also note that you can usually find these at a hardware store for about 5 bucks less than online. Much emptier now, than at the start. When my 1050 Pelican Case arrived, I was nervous because it was bigger than I thought. Turns out, it was PERFECT. The case is built to take abuse and it waterproof. It lived up to the hype. In my case, I stored 1 Kind bar, 2 GU, my ID, $20, spare batteries, extra flag patch (in case someone needed one), Nuun tablets, my iPhone 5, a small role of athletic tape, and spare socks. Super happy with my case choice as it allowed me one single place to store all my “extras.” I didn’t need dry bags, zip locks, or anything else to keep everything I needed safe, secure, and dry. Shirt: Adidas Performance Men’s Sequentials Climachill Run Short Sleeve Tee. Light, breathable, and dries SUPER quick. Unless my next Ruck is in winter, this is my go-to shirt from here on out. Absolutely loved it. I’d note that I got the shirt a little smaller than normal. This made the fit a little tighter, making it somewhere between a compression shirt and a t-shirt. I really liked they way that worked out. Shorts: This is probably one of the items I vacillated the most on. I finally went with a pair of Koppen Tec Shorts. These were great because they are super light, comfortable, and dry fast. Along with that, all the pockets have mesh interior, which means water drained instantly. Socks: This is where I took the biggest gamble. At the last minute, I bought a pair of Smart Wool Running Socks. Socks are important because you want to keep your feet as dry as possible. There are plenty of socks our there that claims to help with wet feet and your options are usually either some sort of blended sock or wool. In the end, these did good. I don’t know how much they really helped because we were wet pretty much the whole night. So, “water protection” was really a relative thought. That said, I’d happily wear these again. I’ll note that I brought backup socks. I’d probably bring them again because they use little space and weight. But, I can’t really think of a time that I might use them. If you change socks, they are just going right back into wet shoes that will likely be in water again. So, not sure it is really worth it. But, again, size/weight investment is minimal. Underwear: Under Armour. Nothing fancy. Did their job. Shoes: Shoes are something I’d want to improve for any future events. I chose to use my Brooks Glycerine 12s for the ruck and trained with them prior to the night. During training, they always held up fine. I was particularly drawn to them because of their cushion and comfort. Knowing I was going to bear a lot of weight, I wanted something to help absorb the load. They did the job great in that area. Where they lacked was water drainage and traction. Our ruck took us on a lot of trails (muddy trails) and these simply didn’t have enough tread for the task. In the future, I’d want to consider a more hybrid shoe that drains better and has a better tread setup. Perhaps a Nike Trail Shoe or Solomon Trail Shoe (which I saw the Cadre wearing). Of course, if your course won’t have any trails (like, New York) then don’t worry as much about tread, but heavily consider water drainage from the shoe. That’s a key. This post was written as an AAR after my first event. 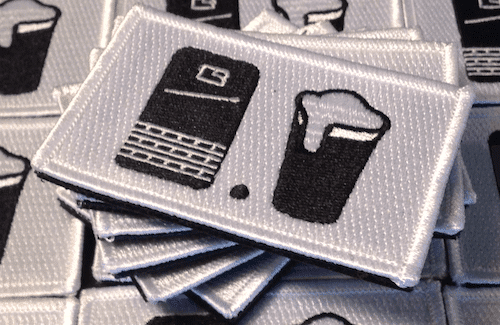 I have now completed multiple events, including GORUCK Heavy, Tough, and Light. Based on my experience this is my current GORUCK Packing List recommendations for all three events. I’ve also clarified What to Wear to a GORUCK event. So, is there anything I wish I had? My initial answer is, outside of a few extra Kind bars, no. That said, there were a couple teammates that brought some webbing that ended up being very useful. I would consider adding that to my ruck, for the sake of the team. In all, the event was really freaking hard. I think, gear wise, I was adequately prepared and would only tweak a few items as noted. If you have any questions or want to share any of your GORUCK must-haves, use the comments below. Thanks for the shout out brother. Great post! Thanks for the AAR! My big question is about shorts vs. pants. I train in shorts, and my GRT is next week (probably 80s at the start, maybe 60s at the end). I’ve heard that knee protection is a big deal…but I am also worried about just overheating at the beginning and then being soggy in long pants for the rest of it. Any wisdom to impart? I feel like shorts/pants is the same question as shoes/boots. Whatever works for you is the right thing. If you haven’t been training in pants, then an event is not the right time to “try” it out. I’ve only ever used shorts. even in my winter event, I wore shorts over a pair of compression pants (which cadre called yoga pants). I’m doing the 9/11 HTL in DC and plan to be in shorts the whole time.